Intuitive. Unique. Innovative. Those words are the best way to describe Green Bay Fiber Artist Laurie Boyer’s work. When she adds to that mix the use of rare breed fleeces, her “Rare Wear” collection is born. 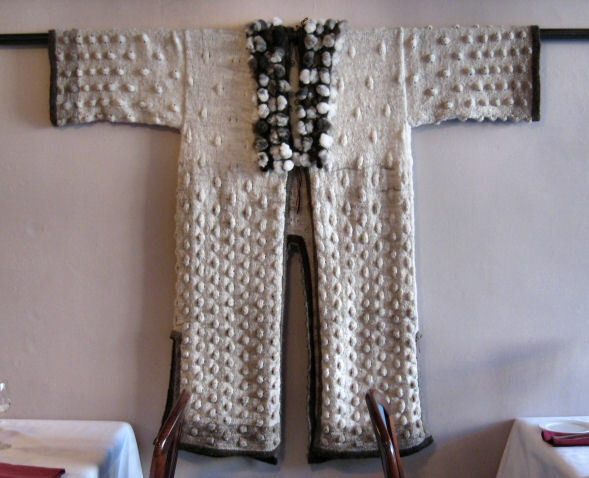 The Dining Room at 209 Main, Monticello, opens its new textile display which exclusively features Boyer’s one-of-a-kind yarns, original garments and incredible felted clothing and sculptures. “Rare Wear” brings to the forefront an artist statement in three-dimensions. Boyer is a self-taught spinner whose first experience with a drop spindle turned into a passion for innovation in spinning. “It took me two weeks, eight hours a day, to produce a yarn of quality,” she said of her start in spinning with a wheel. “Then I began experimenting.” Her experiments, fueled by an unbelievably creative mind, produce one of a kind yarns—‘hardwear hanks’ that include nuts and washers, turkey feather yarns, and the Enabler Scarf pattern and yarn. “The Enabler Scarf’s yarns begin with 100 icicles and then the rest of the yardage has bobbles,” she said. She gives the first stitch and instructions along with wholly unique yarn in a variety of colors and a “wild pin” she has Pat Herman create for her scarves. 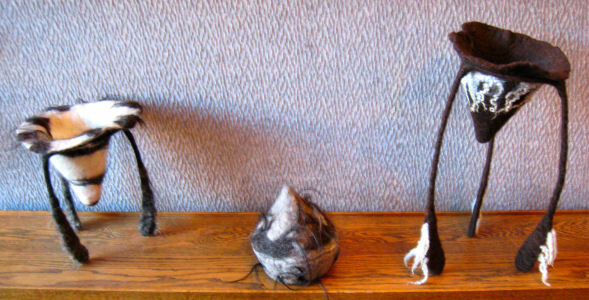 It is Laurie’s skill in spinning, knitting and felting that allow her to create art-quality pieces from raw fleece to finished display. She has shown her work in juried shows in New York, Sheboygan, and Brown County. Her art has won national and international awards, including New Zealand’s Majacraft, Ltd. Innovation in Handspun Fiber Competition where she won the international Supreme Winner in 2003 and 2005 and USA National winner in 2003, 2004 and 2005. Boyer’s work was showcased in Spin-off Magazine and Interweave Press’ Handspun Treasures From Rare Wools. A trip through the exhibit showcases Boyer’s versatility—felted projects for display, felted leggings for wear and knitwear—the Bubble Duster, the Navajo-Churro Tan pocket vest, and the Shrimp-edged pullover, to mention a few. Add to that an incredible display of unique and innovative yarns in natural and dyed colors. “I prefer to work with the natural-colored wool, but many people want color,” she said. The second dimension Boyer brings to her works of art is her passion for preservation. Although she said she uses many different sheep breeds, she focuses much of her “stash” on rare sheep breed fleeces. She lovingly speaks of the Navajo-Churro, the Corriedale, the Coopworth, the East Friesian, the Tunis, the Karakul fleeces that she has helped skirt after shearing and treasures. Using New Glarus’ Rainbow Fleece Farm’s Salish and English Leicester fleece, Laurie created a pocket pillow for the display. “Every breed is just ten years from extinction,” she said. Using these fleeces and encouraging breeders-farmers to continue to raise these rare breeds for hand-spinners has become her mantra. Boyer’s third dimension is her intimate understanding of the fleece itself. “I look at the fleeces, picture how they hang on the animal and then tweak it for people,” she said. Locks from the sheep adorn much of her knitwear and yarns. The Cotswold Lock Sweater features a knit-wear that looks like it was taken from the three-year old sheep named Ears. It includes unique buttons that are “found” items, some of which might be discovered caught in the fleece of the sheep in the wild. The Rare Wear exhibit will be available for viewing in a dining venue Wednesday through Saturday nights, from 5:00 to 9:30 PM at The Dining Room at 209 Main. All Boyer’s collection is available for purchase. She includes care instructions and knitting tips with her yarns. My philosophy is a simple one. Whenever possible I buy raw wool directly from local farmers. Not only does this encourage them to stay in the business of raising sheep, but in a small way helps to cover the cost of raising an animal for a year. My initial interest was in assisting those who maintain rare breeds, but have since expanded it to include all naturally colored sheep and fiber animals. 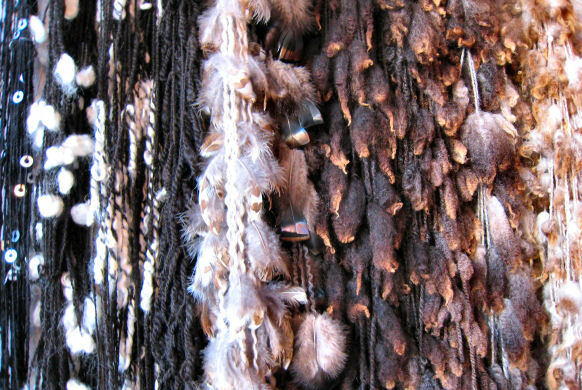 Many of the yarns and finished pieces include locks intact as they would naturally appear on the animal. What could be more beautiful? Today Wisconsin is missing one vital aspect in the wool processing system and that is a good scouring train. This year 5% of all my profits will be donated to David Kier to help establish a scouring system in Eleva, Wisconsin. David is the best shearer I have known. We are fortunate to have his extensive knowledge of sheep, their diseases and care, and his shearing skills geared toward the hand spinner here in our state. Anything we can do to assist him in this endeavor would be appreciated. The Dining Room exhibit includes: "RareWear" items for the body and home created from the fleece of endangered breeds of sheep: "Hardwear Hanks" skeins of yarn which contain hardware from the local hardware store; "The Enabler Scarf" skeins which begin with 100 icicles and the remaining yardage in bobbles with the first stitch already made and the end hidden. A wild pin created by Pat Herman especially for my yarns is included with "The enabler Scarf" so that no other closure is necessary for this simple yet elegant wrap. I hope you enjoy the items that have been selected for this exhibit. They are some of my personal favorites.